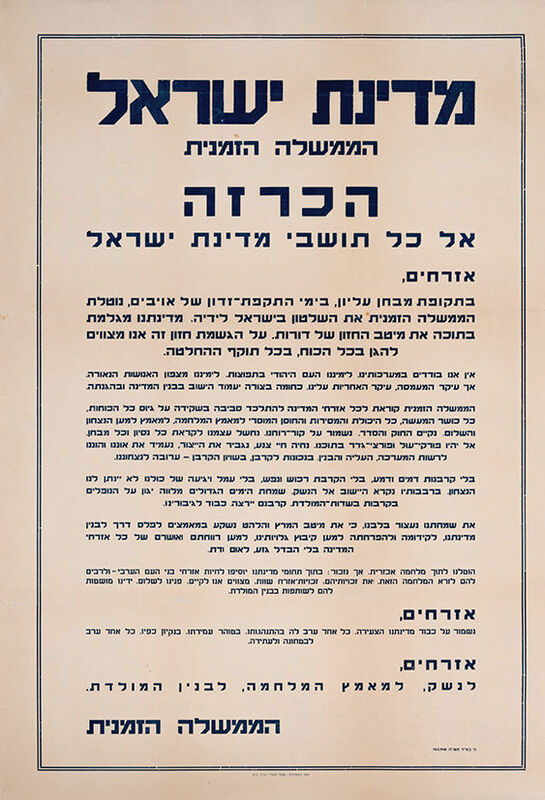 "Hachraza El Kol Toshvei Medinat Israel" [Announcement to all Inhabitants of the State of Israel], a poster issued by the Provisional Government. Tel-Aviv: "HaPoel HaTza'ir" cooperative press, Iyar 5 (May 14), 1948. This was the first poster to be printed by the Provisional Government. The poster calls upon the inhabitants of the state to enlist for the defense of the homeland and to work for its welfare: "At a time of supreme trial, at a time of malicious attack by our enemies, the Provisional Government is taking the rule of Israel into its hands"; "We have been thrust into a cruel war. But let us remember: Citizens who belong to the Arab nation will continue to live within the borders of our state - and many of them find this war abhorrent. We are obliged to uphold their rights, the equal rights of citizens. We seek peace. We stretch out our hands to them as partners in building the homeland. Citizens! Let us uphold the honor of our young state. Each one of us maintains it with his behavior, his good character and his integrity. Each person is responsible for its security and its future". 61.5X95 cm. Good condition. Folding marks, creases and minor blemishes. Some stains. A few tears, mostly at the margins and folding marks, some open (one open tear affects text). The entire poster is mounted on thin acid-free paper.